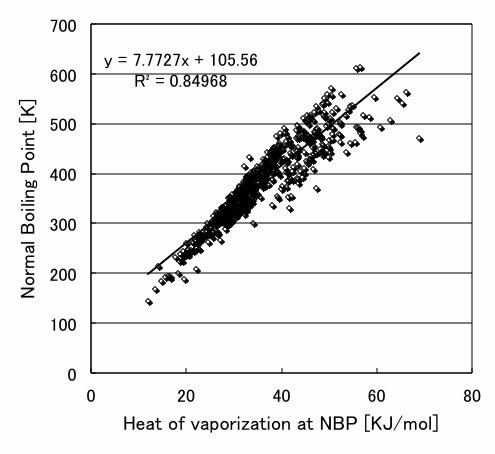 The most famous method to estimate Heat of vaporization (Hv) would be Joback Method. (Please refer to WikiPedia) I have known this method recently, so I have never checked the accuracy of this method. 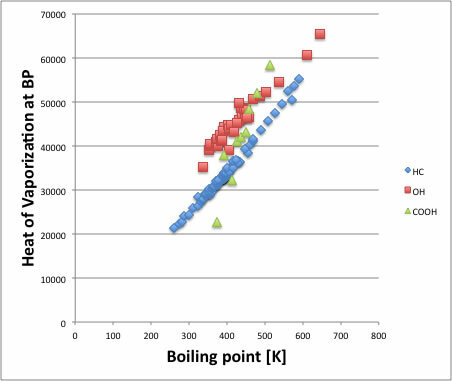 This estimation calculate Hv at boiling point with Functional Groups Contribution method. But if this calculation result is good, then it means that each functional groups effect are identical at boiling point. I always use Corresponding state theory (CST) to estimate thermo chemical properties. CST basement is set to Critical Point (Tc, Pc, Vc), and get certain temperature property with how far this temperature from Critical Temperature (Tc). So it is very interesting Joback method set base boiling point instead of Tc. It is not Joback Method, but I have the chance to check the accuracy of estimating Hv at boiling point with Pirika Functional Groups set. 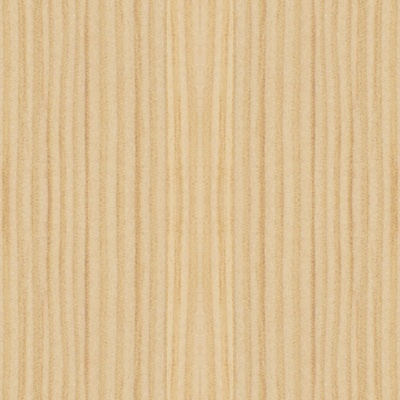 The result is fairly high, so the result of Joback method is not so bad. Please refer to the difference of Joback and Pirika Functional groups set with this article. 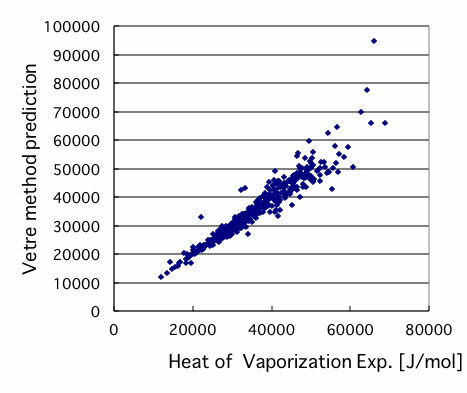 There are several Corresponding state theories (CST) to estimate Heat of Vaporization (Hv). The Vetre method is one of these. This method calculate Hv with this scheme. I checked the accuracy of this method with the data of ”The Properties of Gases & Liquids". The higher Hv area, the error become large. I made estimation scheme with artificial neural network (NN) method and put the JAVA applet on my HP pirika. The accuracy of this method become like below. This heat of vaporization is function of temperature, and with increasing temperature, Hv is decreasing. And at Critical Temperature (Tc), Hv become 0. For the Acetone case, it become like this. I always use Watson scheme to get Hv at certain temperature. dHv1: Hv at boiling point, Tr1: boiling point/Tc, Tr2: certain temperature/Tc, dHv2: Hv at certain temperature. With this scheme, I converted the data that are showed at Vetre method, to 25℃ and plot with experimental data, the result become like below. 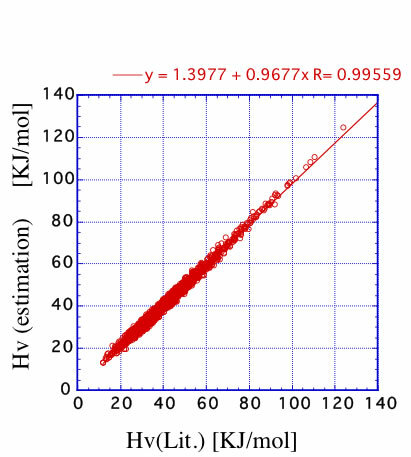 Other CST method, Pitzer-Carruth-Kobayashi method calculate Hv at certain temperature with this scheme. This scheme is showed below. The accuracy become like this. Please try JAVA applet put on Pirika site. Let’s examine temperature dependency of Hv more detail. 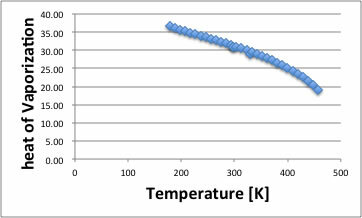 I chosen several none polar compounds and plot Hv to the temperature. I showed the result above figure. 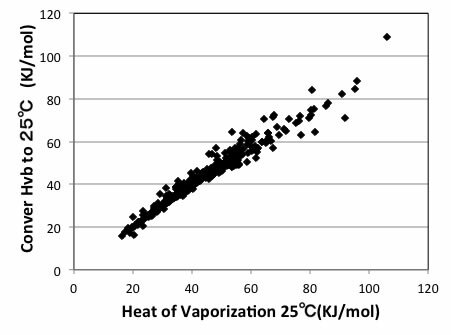 The heat of vaporization become 0 at critical temperature, so I rewrote this figure with relative temperature difference (1-Tr) . Then for every curve, the exponencial terms of (1-Tr) become 0.38-0.39. This is the resone Watson scheme use 0.375 as exponencial term. 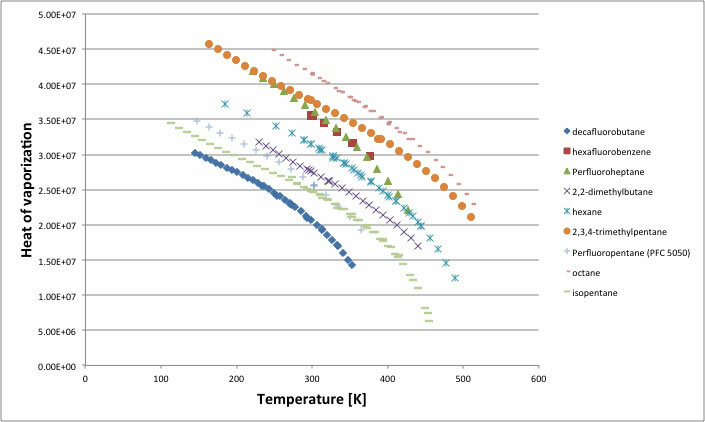 If there is one experimental Hv data, other coefficients are canceled, so I can estimate temperature dependency of Hv. The Pitzer-Carruth-Kobayashi method also use the exponencial terms of (1-Tr) = 0.354, so it is very simular. Now, it is very difficult to get good Critical temperature for new rather large molecules, it would much better to get good Hv at boiling point and convert it to certaine temperature. 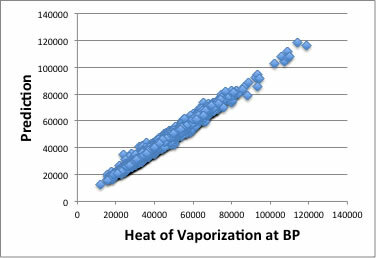 So, Let’s see the Hv at boiling point more detail. 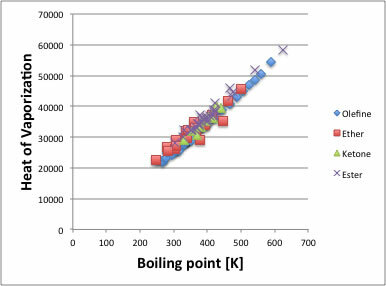 I plotted the data of Hv listed ”The Properties of Gases & Liquids" to boiling point, then I got the figure showed below. A lot of compounds are sit on the line. This relationship is known as the Trouton law. 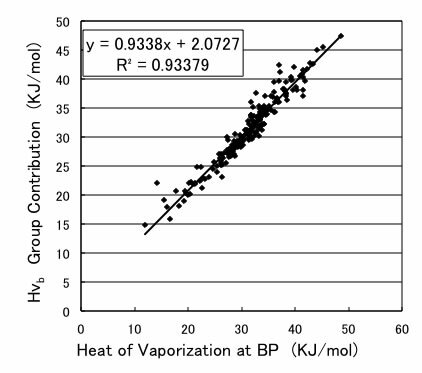 The Trouton Law said that the none polar liquid’s Heat of Vaporization (Lb) at boiling point (Tb) have correlation. The modified Trouton Law, Kistiakowski scheme is written like below. The error of this scheme is said with ±3%. But this scheme can not apply for polar liquids. For Polar liquids, I need apply Watson-Negishi scheme. This scheme need individual parameters for the type of compounds. Let’s examine several type of compounds. 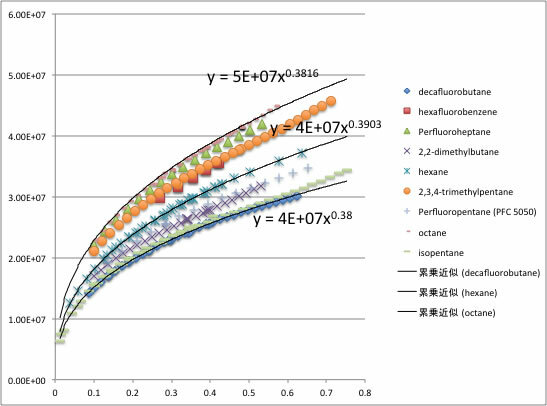 For hydro carbon (HC), there is very beautiful correlation Hv to Tb. 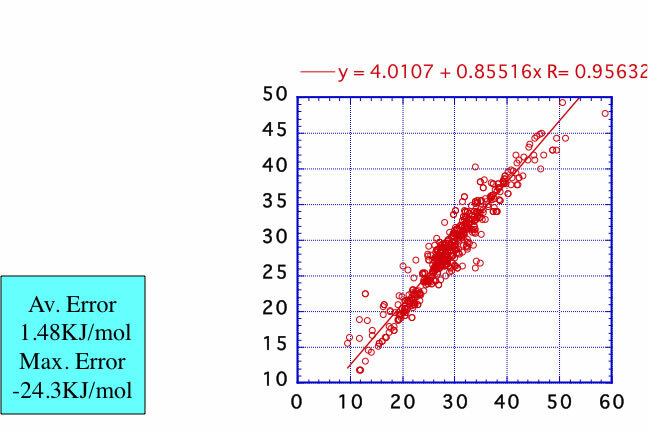 The Alcohol compounds case the line is parallel to HC line, so if introduce one parameter for Alcohol, I can handle all at once. Other olefine, Ether, ketone, Ester compounds are same with HC line. The only problematic compounds is Carboxylic Acids. Now, I can understand that hydrogen bonding make confuse Trouton Law. (I need point out one thing. If I use this result, I can estimate Hydrogen Bonding energy at any temperature.) I can understand the abnormality of Carboxylic Acids like this. The small Carboxylic Acids compounds evaporate as dimmer. So they have lower Hv compare to same boiling point hydro carbon compounds. The molecular weight of Carboxylic Acids increase, the ratio dimmer evaporation decrease, and the line become same with alcohol compounds. The final scheme I made for my simulator have this accuracy showed below figure. I did not made new temperature dependency scheme, but maybe Watson scheme is enouogh so far.